When you have any dietary restrictions, it can be very difficult to find places to eat when you are out and about. Restaurants can be difficult to work with, ingredients can be added, menus can be changed, and that can lead to quite the headache in trying to find somewhere to sit down and have a bite to eat. I know this has been one of the biggest causes of frustration in working with my peanut allergy. So when I find a gem that gets it, I have to share. 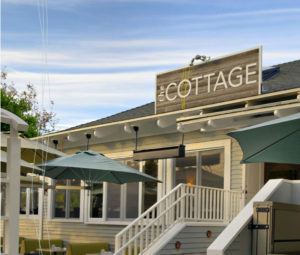 This first restaurant post has to be about one of the best little restaurants my husband and I have come across, The Cottage in La Jolla, California. Last year, I took my husband on a little weekend get-away for his birthday, and we ended up in La Jolla, California. While we were there, we came across this amazing restaurant, The Cottage. I had called ahead to ask if they used any peanut or peanut products in their food, and they said they did not. We checked again as we were seated (I always try to double-check because some people may not be as familiar with the allergy issue). We were reassured that they did not use any peanut or peanut products, and we were safe. However, as we gazed at the menus looking for something to eat, I found that they had a gluten-free menu and other allergy tips for ordering. That caught my eye. Usually places do not put in the extra work to let you know the different options for ordering things, in order to meet your dietary restriction. Then the service. Our waiter came out and was extremely helpful and friendly as we re-explained my dietary restrictions (no nuts, no dairy). 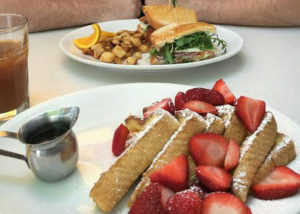 Completely forgetting that the French Toast is dipped in milk, I ordered it, and my husband ordered the egg sandwich (which is out-of-this-world amazing). The waiter came back to our table a couple of minutes later explaining that the French toast was dipped in a milk batter, but he talked with the chef and they would be making a separate batter with soy milk for me. I was amazed. Usually people become annoyed or frustrated when having to work with my food allergies, but here they were going completely out of their way. And the food was INCREDIBLE. We have been able to go back one time after that, and again were astounded with their sensitivity and accommodation. They had ran out of soy milk when we got there, and the chef personally left and walked to the nearest grocery store to buy more so that he was able to make my favorite French toast. I still have the image of him smiling and waving at us as he walked down the street. I cannot wait to go back again and eat that same amazing meal. And I encourage anyone, but especially anyone with dietary restrictions, to go and visit The Cottage. That is so amazing! My husband and I found The Cottage a few months ago, and I’ve dreamed of the stuffed French toast ever since. We, too, received amazing service. No food allergies on our end, but this just made me love them all the more. Congratulations on your blogging endeavor- looking forward to watching it grow! Thank you so much for your sweet comment! If only they could make some sort of delivery service 🙂 I would have that French toast for breakfast every morning!